← The 3rd Qtr. 2015 NYCentral Modeler Is Here!! The future of the Adirondack Scenic is in peril. 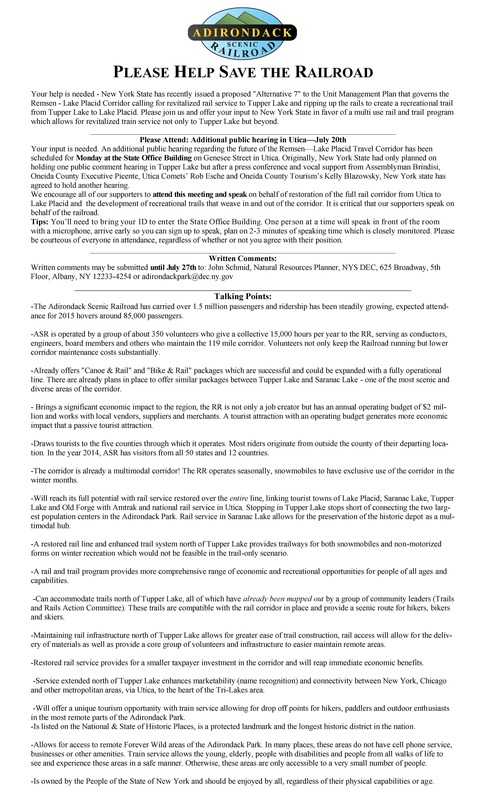 There is a movement underway to remove the railroad to convert the land between Old Forge and Lake Placid be converted to a “community-connected recreational trail”. The current usage of this area allows for snowmobiling, bicycling, jogging and walking in addition to providing a well used historic railroad that runs nearly 80 miles of seasonally used recreation for over 1 million tourists and outdoor enthusiasts. This has become critical as the state is moving rapidly on this issue.